Kayakoyu Yolu Uzeri Hisaronu The Carmina Hotel is located in the popular summer resort of Hisaronu on the beautiful Turkish Riviera. Only a short walk from Hisaronu's bustling centre, which comes alive at night, and just 3 km from Oludeniz resort and its beautiful beach, this lively 2 Star hotel is perfectly situated to meet everyone's needs. 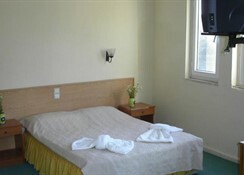 The Carmina Hotel features 40 guestrooms and 13 apartments with modern amenities and friendly service. 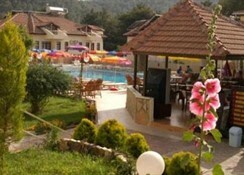 Dalaman Airport (DLM) is 57 km from the Carmina Hotel. Local Tips: The famous Blue Lagoon and beach is within easy reach by local dolmus (mini-bus), as is the neighbouring town of Fethiye, which offers a market, covered bazaar and plenty of shops, restaurants and bars, around 7km away. Dalyan, the home of the loggerhead turtles and Lycian Rocktombs, is the most popular day trip, around an hour's journey away. Food, drink and entertainment: Bed and Breakfast accommodation with an option for Half Board is available plus self-catering in the apartments (with an option to add breakfast). Turkish breakfast and dinner are served in a traditional Turkish open buffet style. The Carmina Hotel has a delightful a la carte restaurant and a friendly bar. Sports, games and activities: Swimming pool with children's section, sun terrace with sun beds and umbrellas, children's playground, Billiards, table tennis, darts, karo, water polo, water volleyball. Plenty of activities nearby such as water sports, paragliding, diving, kayaking, horse-riding and much more. 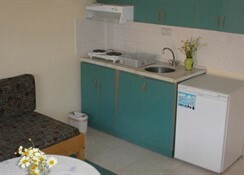 Additional: Reception, front office, daily money exchange, security box, Internet access, Satellite TV. The Carmina Hotel features 30 double or twin rooms for up to 3 people (can be booked for single use), 10 family rooms (max 4 people) and 13 apartments (max 4). Rooms are simply furnished and have air-conditioning (extra charge payable locally), private bathroom (shower, hair dryer, WC), Satellite TV, telephone, safe (extra charge payable locally), and a balcony or terrace. Free baby cot available on request.